How will climate change affect the shells and skeletons of sea life? A new study has yielded surprising findings about how the shells of marine organisms might stand up to an increasingly acidic ocean in the future. Under very high experimental CO2 conditions, the shells of clams, oysters, and some snails and urchins partially dissolved. But other species seemed as if they would not be harmed, and crustaceans, such as lobsters, crabs, and prawns, appeared to increase their shell-building (see interactive). “Marine ecosystems—particularly those based on calcium-carbonate shell-building, such as coral or oyster reefs—could change with increasing atmospheric CO2 (carbon dioxide),” said Justin Ries, a marine biogeochemist and lead author of the study, published online Dec. 1, 2009, in the journal Geology. Sensitive species could lose their protective shells and eventually die out, while other species that build stronger shells could become dominant in a future ocean that continues to absorb the buildup of CO2 in the atmosphere caused by industrial emissions, deforestation, and other human activities. Excess CO2 dissolves into the ocean and is converted to corrosive carbonic acid, a process known as “ocean acidification.” At the same time, the CO2 also supplies carbon that combines with calcium already dissolved in seawater to provide the main ingredient for shells—calcium carbonate (CaCO3), the same material found in chalk and limestone. While a postdoctoral scholar at the Woods Hole Oceanographic Institution (WHOI), Ries worked with WHOI scientists Anne Cohen and Dan McCorkle. In tanks filled with seawater, they raised 18 species of marine organisms that build calcium carbonate shells or skeletons. The scientists exposed the tanks to air containing CO2 at today’s level (400 parts per million, or ppm), at levels that climate models forecast for 100 years from now (600 ppm) and 200 years from now (900 ppm), and at a level (2,850 ppm) that should cause the types of calcium carbonate in shells (aragonite and high-magnesium calcite) to dissolve in seawater. The test tanks’ miniature atmospheres produced elevated CO2 in the tiny captive oceans, generating higher acidity. 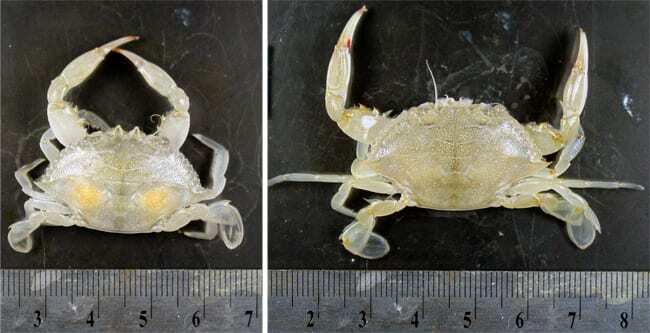 The researchers measured the rate of shell growth for the diverse species ranging from crabs to algae, from both temperate and tropical waters. They included organisms such as corals and coralline algae, which form foundations for critical habitats, and organisms that support seafood industries (clams, oysters, scallops, conchs, urchins, crabs, lobsters, and prawns). In waters containing more CO2, organisms have more raw material (carbon) to use for shells. But they can only benefit from the high CO2 if they can convert the carbon to a form they can use to build their shells and can also protect their shells from dissolving in the more acidic seawater. The scientists found clear differences among species. “The wide range of responses among organisms to higher CO2—from extremely positive to extremely negative—is the truly striking thing here,” Ries said. Crustaceans provided the biggest surprise. 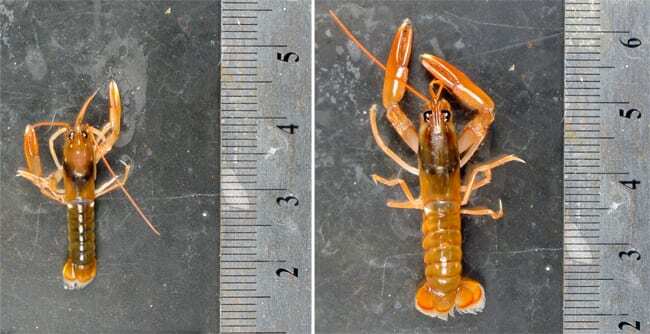 All three species tested—the blue crab, American lobster, and a large prawn—defied expectations and grew heavier shells as CO2 swelled to higher levels. Ries and colleagues found that species with more protective coverings on their shells and skeletons—crustaceans, the temperate urchins, mussels, and coralline red algae—are less vulnerable to the acidified seawater than those with less protective shells, such as conchs, hard clams, and tropical urchins. 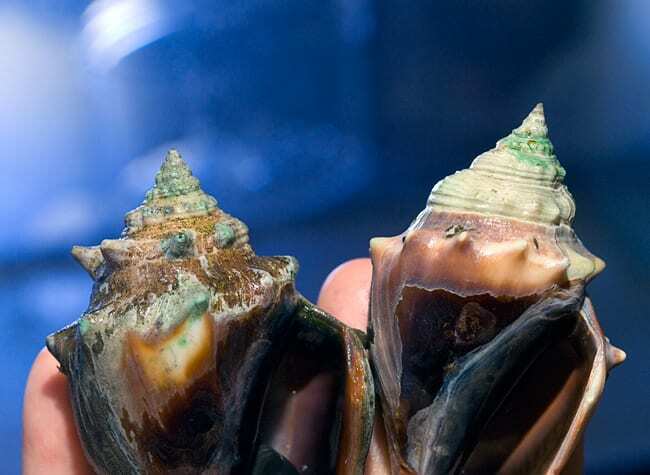 All of the test organisms continued to create new shell throughout the experiment, Ries said, but some suffered a net loss of shell because older, more massive portions of their shells dissolved under the highest CO2 conditions. To build shells, organisms extract calcium ions (Ca2+) and carbonate ions (CO32-) from seawater, which combine into the solid crystals of calcium carbonate (CaCO3) that shells are made of. However, seawater also contains hydrogen ions (H+), or protons. These tend to bond with negatively charged carbonate ions, leaving fewer for organisms to build shells. So shell-builders have a task: They have to eliminate hydrogen ions in the places where they lay down shell. 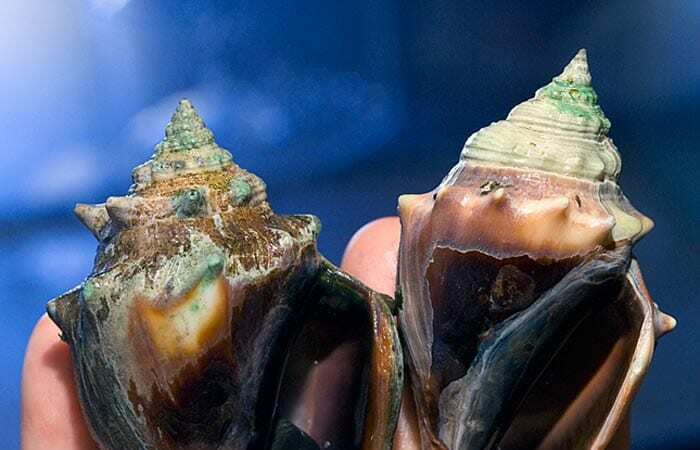 One theory, proposed and discussed by Cohen and colleague, geochemist Ted McConnaughey, is that shelled organisms solve the problem by creating small, enclosed, fluid-filled spaces next to their shells. From these spaces, they forcibly pump out protons, leaving behind calcium and carbonate ions that combine into the crystals that compose their shells. In a more acidic ocean with more protons, species with stronger “proton pumps” could have an advantage. But even these species might pay a price: Like an air-conditioner working harder in hotter weather, the pumps would require more energy. “This increased energy consumption to build shells may come at the expense of other critical life processes, such as tissue growth and reproduction,” Ries said. Temperate urchins fared better than their tropical relatives in the experiments, and Ries and colleagues hypothesize an evolutionary explanation. Cold water absorbs more CO2 than warm water, so temperate seas already contain more CO2 and hydrogen—and therefore less carbonate—than the tropics. Ries speculates that temperate species may have evolved stronger proton pumps to compensate for the naturally lower carbonate levels in these waters. The results, Ries said, suggest that the predicted rise in CO2 over the coming centuries could cause changes in marine ecosystems—particularly those composed largely of shell-builders, such as tropical coral reefs. Moreover, even organisms that appear to benefit from the elevated CO2 may suffer from the decline of less tolerant species upon which they depend for food or habitat. 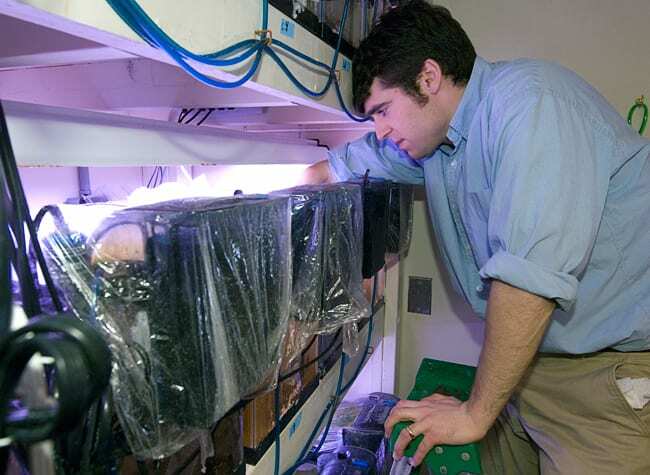 Justin Ries was a postdoctoral scholar of the Ocean and Climate Change Institute at WHOI. This work was also supported by the WHOI Tropical Research Initiative and the National Science Foundation. What happens to carbon dioxide in the ocean? Pure water is neither acidic nor alkaline; it has a pH of 7.0. But because seawater contains many dissolved substances, it is actually slightly alkaline (basic), with a pH near 8.2. The continuing buildup of carbon dioxide (CO2) in the atmosphere means more CO2 going into the oceans. Carbon dioxide dissolves in seawater to form carbonic acid (H2CO3). The latter rapidly breaks down into hydrogen ions (H+) and bicarbonate ions (HCO3–), and the bicarbonate ions further break down into H+ and CO3-2 ions. More H+ ions makes seawater more acidic, but scientists do not think the seas will become truly acidic (with a pH less than 7.0), but rather less alkaline. Marine organisms need carbonate ions to build their shells, but even though the total amount of carbon in solution increases as more CO2 dissolves in seawater, the concentration CO32- ions actually decreases. This happens because more CO2 means more hydrogen ions (H+) in seawater. Those additional H+ ions react with (consume) carbonate ions to form bicarbonate ions. In tropical waters (with temperatures at or above 77°F, or 25°C), as the partial pressure of CO2 (pCO2) in seawater reaches roughly 1,800 parts per million (ppm), the decreasing supply of carbonate ions crosses a threshold, and aragonite—the form of calcium carbonate commonly used in shell—spontaneously dissolves. Aragonite is more soluble in colder waters, and cold water takes up more carbon dioxide from the atmosphere than does warm water. As a result, the threshold at which aragonite dissolves in cold waters will occur well before the pCO2 in the oceans reaches 1,800 ppm. Scientists expect that the cold, fertile Southern Ocean and north Pacific Ocean will reach this threshold by—or before—2070. “The balance is changing,” said Justin Ries, a former postdoctoral scholar in the Ocean and Climate Change Institute at WHOI. “The change in pH is already occurring in surface waters, and it’s hard to reverse.” Because carbon stays in the oceans for a long time, to return CO2 levels to those that existed before the Industrial Revolution, “we’re going to have to reduce CO2 emissions as soon as possible, and then wait a few hundred years for the oceans to adjust,” Ries said. Justin Ries holds two tropical pencil urchins (Eucidaris tribuloides) reared under different levels of atmospheric carbon dioxide (CO2). 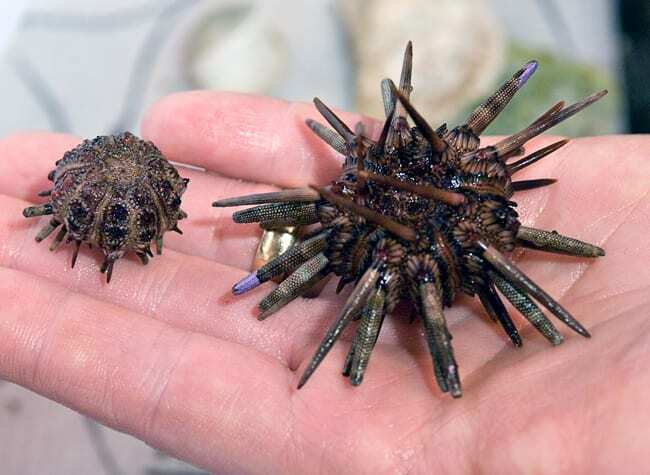 The urchin on the right, grown in seawater under today's air conditions (400 ppm), is healthy and has normal spines. The urchin on the left, grown under very high CO2 conditions (2,850 ppm), is substantially damaged by the more acidic conditions. Most of its spines have fallen off, and the remaining ones show a pitted texture under the scanning electron microscope. Weighing the urchins confirmed that they were actually dissolving in the more acidic high CO2 conditions.